Rosie went to her room and shed a tear. They weren't proud of her. It was very clear. Do you ever feel like your parents don't have time for you? This is exactly how Rosie the raccoon feels. She wants nothing more than for her parents to be proud of her. A town race is announced, and Rosie is excited to run, but her parents are too busy working to make it, and her mom fails to make Rosie's race shirt. Even after her success in the race, she feels her parents aren't proud of her. Rosie feels unloved and decides to run away from home. Though she doesn't realize, her parents work hard because they love her. Will Rosie learn that her mom and dad do what they do out of love? Will her parents find a way to show her they are proud of her? 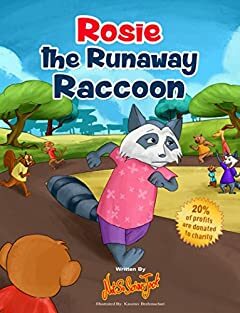 This is a heart-warming story that teaches children things are not always as they seem and running away is not the answer.